It comes every year, and I see the progress we are making every time I work the floor but this year was really special for me! I was offered SHC of Spencer County where we used to pass ice for Jeff Stidam during a 2001 survey war with the state, where we had a pretty ugly union struggle over a decade ago that was highly contested by both sides, and where I had my Serenity Immersion Experience several years back, and where David Baumgartner and I started together nearly 17 years ago. Today we were side by side again! 1. Love “the Huddle” – speed, teamwork, news you can use, and prayers are needed – we need to hardwire it and spread it. Easy to streamline day! 2. Simply Me – the resident knowledge made every room we served so much easier to communicate and share! Should be everywhere! 3. 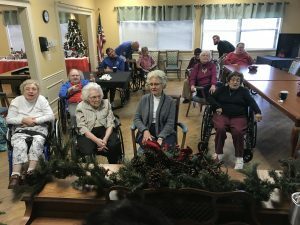 Quality of Life getting better – just a regular Monday had a great bible study that I sat in and participated, tear off the roof caroling before lunch! They needed a break too! 4. Serenity Color Coding helped me once I re-learned it again. Gives me confidence when I understand it -Not everyone knew it but a great tool! 5. SHC uniforms – still look great!Love mine and we need to improve but not cancel! We had great looking stakeholders at every unit turn I made! 6. SHC Medical Partners getting real traction – having that full time Nurse Practitioner on site gives us great creditability and relevant knowledge at our finger tips -it is still a game changer which I could obviously see and we need it to make it a standard! 7. IHN – my nurses liked our stuff more this time than in years past – all of the progress on RAi MAX, ezmar, etc and we are not too far from an integrated system – go faster! 8. Recent Housekeeping Change – based upon what I saw yesterday were hard working people really caring about what customers really want – if they keep that effort up it could be a home run! 10. 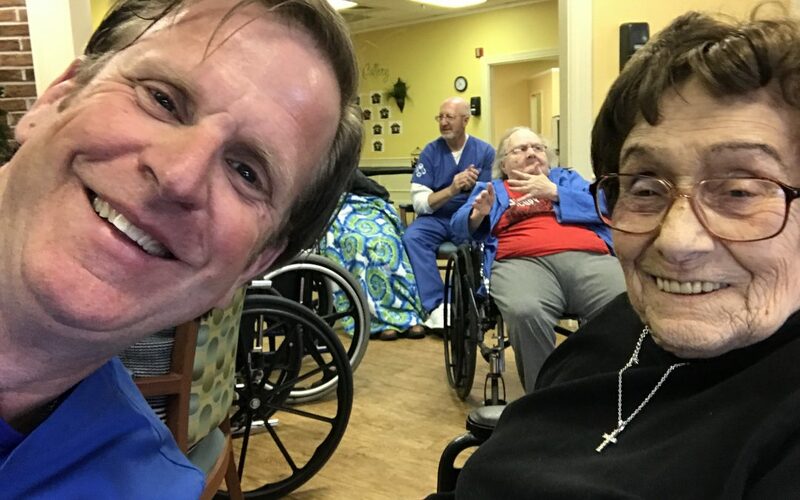 Spencer has great spirit, teamwork, and sense of community that made me want to go back today that I truly miss – when we were helping residents enjoy breakfast side by side my CNA’s were so loving that they knew every subtle resident que with ease and everyone has a great morning! 2. Love to see more therapeutic options outside of traditional rehab such as multi sensory environments as part of daily Q of L mindset or it’s never too late or available for the larger group. 4. Too many door codes to use and remember in one center – many doors should have same codes everywhere in low risk areas – for example, leave the gloves out and I could go faster! 5. New coffee cups that are like Yeti because our plastic ones that are two decades old in design turns cold too fast and I hate cold coffee – we could clean and use over and over again! 6. Time Well Spent needs a facility champion because it was not really a priority or really understood that well and how easy they should all get it especially 1st shift! It was on the break room but not part of the culture! 7. Bigger TV’s in many rooms because many are too small for residents to see and everyone loves a good show! 8. Less turnover because our CNA’s knew their residents like it was their own grandparent and man does that makes a big difference! Thanks for letting our team serve you, the eldersand the amazing centers that we are blessed with because we come back renewed and refreshed and ready to live theRevolution more than ever! Have a great service week!